The statistic shows a ranking of the highest-paid NFL players in 2018. 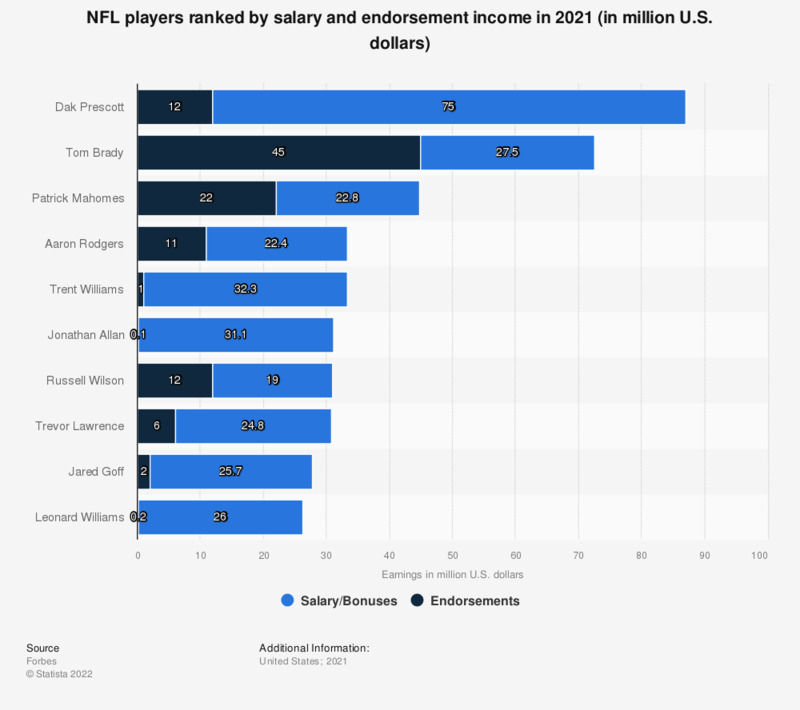 Aaron Rodgers earned 66.9 million U.S. dollars from salary and bonuses and 9 million U.S. dollars from endorsement deals. The quarterback is probably the most important player in football, considering almost all possessions on the offensive end start with the quarterback, who is the main decision maker on the offensive side. The importance of the position is reflected by the high salaries quarterbacks earn in the National Football League. Out of the ten highest-paid players in the NFL in 2015, six were quarterbacks. Pittsburgh Steelers’ quarterback Ben Roethlisberger is the highest paid NFL player, with an income of 48.9 million U.S. dollars in 2015. Roethlisberger has a quite successful track record playing for the Steelers, as he has won a total of 11 playoff games during his career and has played in four pro bowls. The Pittsburgh Steelers have one of the highest payrolls in the league, amassing 170 million U.S. dollars in player salaries. Arizona Cardinals’ Carson Palmer, Dallas Cowboys’ Tony Romo, Denver Broncos’ former quarterback Peyton Manning, New York Giants’ Eli Manning, Cincinnati Bengals’ Andy Dalton complete the list of highest paid quarterbacks in the NFL. As of 2015, Peyton Manning, one of the greatest quarterbacks of all times, had the highest endorsement income in the ranking – 12 million U.S. dollars. Quarterbacks not only have highest salaries in the league, but they have a longer career than the average NFL player. While the average career of an NFL player lasts about 3.3 years, quarterbacks play for about 4.44 years. Kickers and punters, a position that requires the least physical contact in comparison to other positions, have the longest NFL career average – 4.87 years. Miami Dolphins’ defensive tackle Ndamukong Suh is the second highest paid NFL player, with 38.6 million U.S. dollars in income in 2015. Buffalo Bills’ running back LeSean McCoy, Houston Texans’ defensive end J.J. Watt, Tampa Bay Buccaneers’ defensive tackle Gerald McCoy complete the list of top 10 highest paid NFL players.